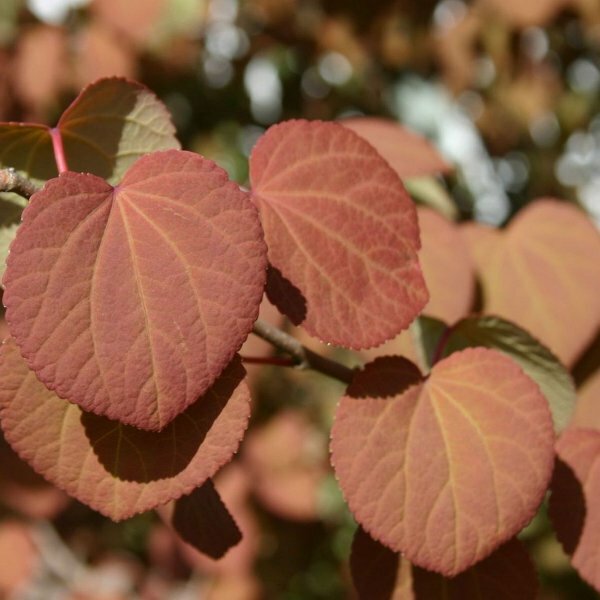 Kindly regarded as one of the world's most beautiful and modest of shade trees, the katsura tree has elegant heart-shaped leaves, red fall foliage and persistent coppery-tan seedpods that decorate the bare winter branches. A deciduous tree native to China and Japan, it is overall an oval-canopied tree but some specimens can become quite widely spreading with sprawling branches. Its gray-brown bark exfoliates in vertical bands, adding winter and spring interest. The heart-shaped leaves first emerge bronzed before becoming a modest green. Each leaf blade has tiny scalloped edges and are usually held in opposite pairs on the branches. In early spring before leaves emerge, flowers adorn thsi dioecious species - red female flowers occur on a separate tree than those of the green male blossoms. 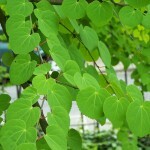 The female tree yields many small green pods that ripen to a coppery tan and split open to shed the winged seeds. 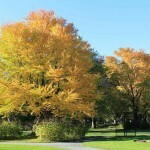 In autumn the foliage becomes a lovely mottled kaleidoscope of yellow, orange-red and dark red. The dropping leaves emit a sweet fragrance that is lightly honey- or sugar-scented. Germination 1. Fill 4-inch pots or a tray with seed-starting soil. 2. Water the soil thoroughly until water comes out the bottom drainage holes. 3. Place the pots onto a drainage rack to allow excess water to drain into a container below. 4. 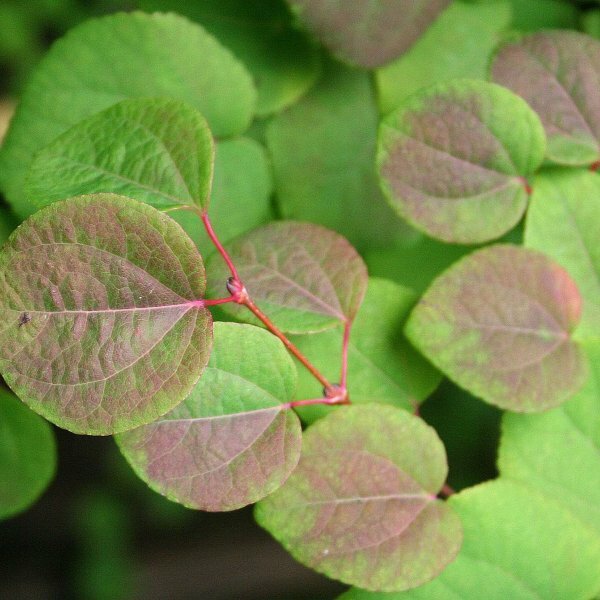 Sow the Katsura tree seeds thinly over the top of the soil. If you're sowing the seeds in a pot, place one seed in the center. 5. Cover the seed with potting soil to a 1/16-inch depth. Grit or coarse sand will also work, because the seeds need light to germinate. 6. Mist the soil or sand with a sprayer filled with water. 7. Cover the pots with clear plastic bags, and place them in a bright location that remains around 70 degrees Fahrenheit. 8. Check the soil daily for moisture. Mist the top of the soil to keep it moist, but not soggy. 9. Remove the clear plastic bag when the seed germinates. It can take two weeks or longer for the seeds to germinate. 10. Place the pots back into the bright location. Water to keep the soil moist.